The blast on two wheels from the past has returned to the Indian market in the form of Jawa Motorcycles. The much-awaited launch of the iconic brand took place in Mumbai today with the Jawa and Jawa forty two motorcycles launched by Classic Legends. The launch comes two years after the formation of Classic Legends, which had acquired the rights for the Jawa brand in India. Classic Legends was formed by Anand Mahindra, Anupam Thareja and Boman Irani, and Mahindra holds a 60 percent stake in this venture. The Jawa and Jawa Forty Two break cover as the brand’s new torchbearers, bringing back the classic appeal of Jawa with a retro-cool twist. These modern machines have the authentic Jawa character that balances performance, capability and quality. An all-new 293cc, liquid-cooled, single-cylinder, DOHC engine nestled within a double-cradle chassis is tuned to bring out the classic riding thrills, making the new Jawa a true modern classic. The Jawa and Jawa forty two are priced at Rs 164,000 and Rs 155,000 respectively. Bookings have begun online at www.jawamotorcycles.com from today. The company also unveiled the factory custom Jawa Perak, powered by a 334cc, liquid-cooled, single- cylinder, DOHC engine which develops 30bhp and 31nm of torque. The Perak is priced at Rs 189,000, and the booking will open at a subsequent date. 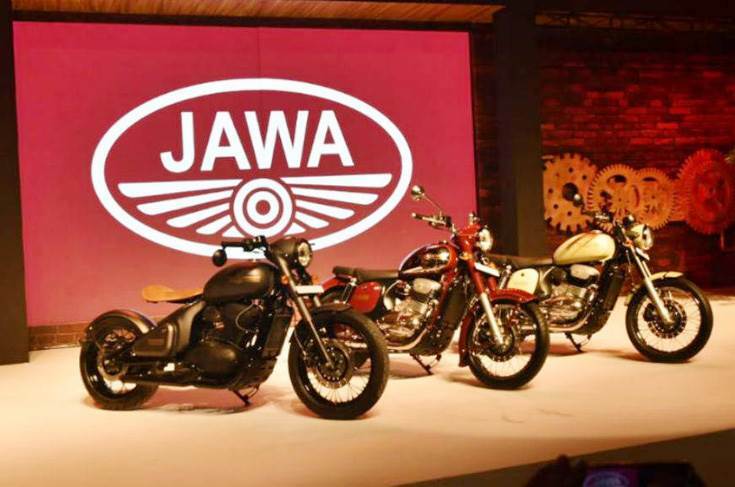 The three Jawa motorcycles will be manufactured at the Pithampur plant with dealerships to begin operations on December 5 and deliveries to happen early next year. The focus initially will remain on the domestic market with 105 dealers and 64 dealerships operational by December 5. The Jawa’s styling is inspired by the Jawa 250 Type A, which was the brand’s first motorcycle to go on sale in India in the 1960s. The distinctive headlight profile, dual-tone chrome finish on the fuel tank, flat saddle, a concealed conventional telescopic fork, twin peashooter pipes and the flared mudguards with pinstripes are reminiscent of the Jawa 250. Adding to the retro charm is the colour options, which create a strong connect to the Jawas of yore. 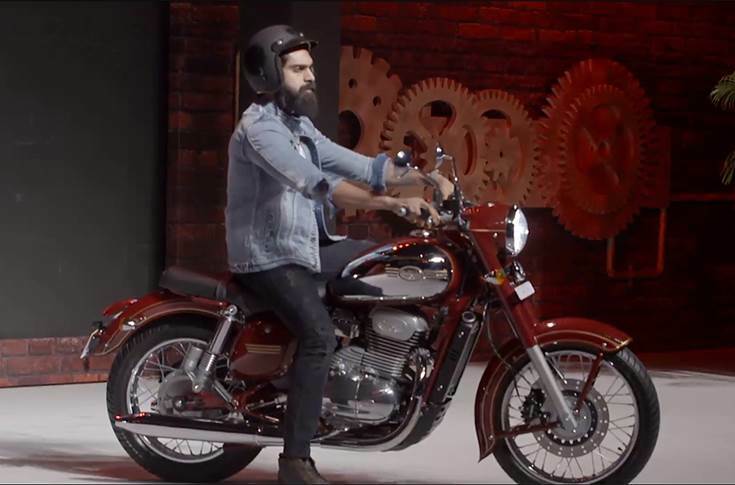 The overall stance and styling of the new Jawa looks highly similar to the original motorcycle and that should appeal to loyalists as well as new-generation bikers who have a soft spot for retro-styled machines. Remarkably, Jawa designers also ensured that the new engine imitates the older motor visually as well. The faux fins, large chrome engine case with the Jawa branding and the twin exhaust ports add a dollop of visual charm to the overall styling. The Jawa Type Forty Two has a more urban and modern theme with matte black elements replacing chrome and matte paint shades. The Jawa Perak is a factory custom and has bobber styling and looks stunning. While it might look retro, the powerplant is a modern, liquid-cooled unit and is also BS-VI emission norm compliant. Classic Legends claims that the engine is an all-new unit and only shares its bore and stroke with that of the Mahindra Mojo’s motor. According to the company, the powertrain has been developed in Italy as well as India. The 293cc, single-cylinder engine develops 27hp and 28Nm of peak torque. Transmission duties are handled by a 6-speed gearbox. In contrast, the Mahindra Mojo, which is available in UT 300 and XT 300 variants, is powered by a 295cc single-cylinder motor that makes 23hp/25Nm in the UT and 27hp/30Nm in the XT. The chassis is an all-new double-cradle unit and is suspended on a telescopic fork and twin shock absorbers with gas-charged canisters at the back. Anchorage on the Jawa and the Jawa Forty Two is provided by a single disc brake at the front and a drum unit at the rear. Single-channel ABS comes as standard fitment. The frame of the Jawa Perak bobber is different and it features rear disc brake. The Jawa rides on spoke wheels wrapped with 90/90 18 tyre at the front and a 120/80 17 tyre at the rear. Seat height of the Jawa is low at 765mm, fuel tank capacity is 14 litres and the bike weighs 170kg (kerb weight). The Jawa will be offered in black, maroon and grey. The Jawa Forty Two will be available in six shades, three matte colour and three metallic options. The Jawa and the Jawa Forty Two will compete against the Royal Enfield Classic 350 which retails for Rs 1.47 lakh (ex-showroom, Mumbai). We will be riding the new Jawa very soon, so watch this space for more updates. Anand Mahindra: "Finally, this fits the Mahindra’s 2W business!" When queried about Jawa taking on Royal Enfield with its aggressive pricing of the three bikes, Thareja said: "We have received a lot of interest from people for the Jawa brand. There is huge demand in the market for this (midsized) bike segment. we will expand the market. There will be a portfolio of products from Jawa but we are not looking to introduce smaller cubic-capacity engines." Ashish Joshi, Chief Executive Officer, Classic Legends said, “It is indeed a historic moment and we are happy to bring Jawa back in India. This seems like the right timing to have come up with this range of motorcycles, as the Indian premium motorcycle market is not only growing but also evolving in consumer tastes and preferences. We are quite upbeat to offer these classics to the motorcycle enthusiasts in the country.